Hi everyone, Carey here! You might have noticed that we’ve been away last week. 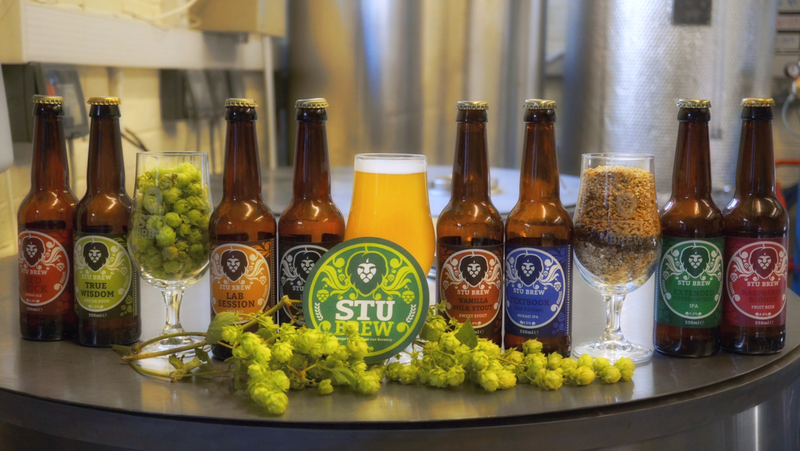 We embarked on our first ever Stu Brew Tour. I thought I’d give you all an update to the exciting things we’ve been up whilst we’ve been away. Our time in Brussels was amazing. Thank you to everyone who came with us. The team stayed in the Meininger Hostel which was an excellent choice. The beds were very comfortable which was perfect after a long day of taking in the sights. Our first day, Saturday, started at 10am sharp with a tour of Cantillon Brewery. Our guided tour was fantastic. I learnt a lot about the brewing process and it was great to see the different techniques used to create Lambic beer. The brewery was founded in 1900 and is renowned for its Gueuze that is aged in oak casks. The tour lasted half an hour and we were greeted at the bar with two samples. I opted for the classic Gueuze and the Kriek, a sour cherry lambic. Squad goals, am I right? Later that afternoon we went to 3 Fonteinen which is another famous brewery located in Beersel. We spent the day basking in the Belgian sun (I didn’t know this was a thing either…!) tasting some fine Lambic beers. The brewery was in a beautiful location with a superb beer garden. After a short but expensive Uber ride back to the city centre we gathered in Brussels Beer Project for a tasting session. This was one of my highlights of the trip. The experience included the biggest cheeseboard I had ever seen. My favourite beer from BBP was probably the Smoked Blonde Stout – an interesting concept! Dom, Tom and Sandy taking on the mighty cheese and meat board at BBP. The team split into groups the next day. A few of the more cultured members decided to take a trip to the European Parliament to try and sort Brexit out once and for all, but unfortunately things didn’t work out. Harry Conn, one half of our stocks and sales team, tried to get in for a toilet break but was unfortunately turned away. Better luck next time. Meanwhile, the rest of the team tried out a great bar called Moeder Lambic. We also tried out Brew Dog in Brussels later that evening which I would seriously recommend to anyone visiting the city! The rooftop terrace was the perfect place to make the most of the sunny weather. The next day I went with Chris, Sandy, Tom, Brett, Dom and Arthur for another visit to Cantillon. This was a lovely afternoon where we had the chance to taste a wider range of Cantillon’s beers exclusive to the tap room. As many of the tour attendees will know my favourite beer was the Kriek! I’m not a huge fan of sour styled beers normally but it seems that my tastes have changed after becoming acquainted with new styles on this trip! Later that evening the whole team paid a visit to Amadeus Rib House. This was a great experience. The Stu Brew record for rib consumption at Amadeus is currently held by Ali Middlemiss who managed to devour 3 full racks of ribs (I’ve just had fajitas for tea and thinking about how much food I ate that night makes me want to pop!) Congrats, Ali! Our final day saw us taking in some more sights before our flight. A selection of us went to see The Atomium. This is sculpture is an icon of Brussels. I was really impressed at the attraction’s architecture. Whilst we were here we learnt that it was built for the World fair in Brussels in 1958. This was the first post-war World Fair so it pretty much had to blow the world’s socks off. The Atomium remains a popular tourist attraction and it isn’t too hard to see why. I learnt that the nine spheres are supposed to be a replica of an iron crystal magnified 165 billion times. Not too shabby! After visiting this work of art we popped along to Brasserie De La Senne which was off the beaten tourist path but worth the visit. I particularly enjoyed Brussels Calling which is a Belgian Style Pale Ale! There were so many great breweries that we visited and Brussels is definitely the kind of place you NEED to visit if you’re a fan of beer and the culture surrounding it. I was craving cheese and meat for the majority of the holiday – I was so happy when Tom discovered La Mort Subite which was a stone’s throw away from the main square of Brussels. Their mixed meat and cheese board was DIVINE. This was, for me, the perfect end to the trip. In my opinion, the trip was great! We made some great memories and I would argue that this was the perfect way to end my year of being involved with Stu Brew alongside the majority of my amazing committee. I hope you’ve enjoyed reading about our time in Brussels and hopefully this review of the city will tempt you to pay it a visit if you get the chance. Finally, I’d also like to thank our superstar trip co-ordinator, Rachel, for planning the trip! Keep an eye out for our tour video which will be hitting the social media channels in due course.